Do you suppose restaurant owners go somewhere to learn how to make a place appealing? Pensez -vous qu'il existe une école où les propriétaires de restaurants apprennent à créer des ambiances aussi agréables? Very close to the water. Could be interesting on a windy day! Lovely, wish I could be there now! Bellissima foto da cartolina . E' riuscito a vedere il mio blog grillo di Villafranca ? I'm not sure that I find the scene appealing. The chaise lounge has an interesting curve. 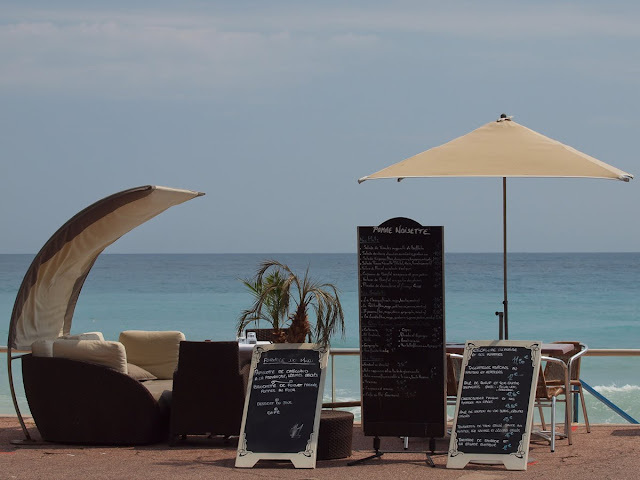 Not sure whether the Restaurant owners actually pay for the privilege to place their "ambiance" on public grounds, aka the Promenade du Soleil. Once it was a pleasure to walk along the seaside up on the promenade - now on busy days it is difficult to pass the "ambiance" without being pushed onto the street. boyfrombeach, yes well, that's how it is - personally I don't mind - all part of the fun as I love photographing people. No people in winter! I certainly wouldn't mind sitting there,sipping a cocktail watching beautiful people walk by.